The Holley VoluMAX fuel filter features a tube-style design. It holds a very fine 7 micron paper element that’s capable of filtering up to 750 gallons of fuel an hour. The filter is constructed of 150” wall aluminum tubing with an outer diameter of 2.5” and a length of 10”. Removable end caps have AN pipe threads and are sealed with an O-ring. The caps have female 1/2” pipe threads so any fitting can be installed. 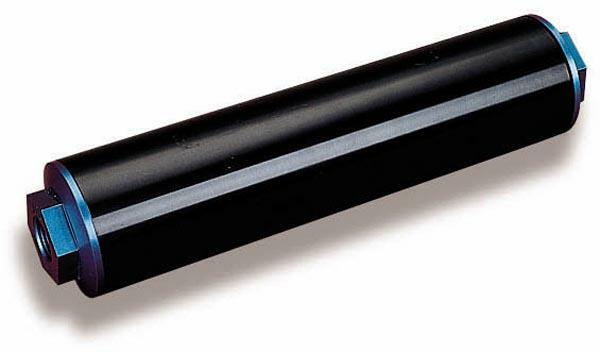 The filter is anodized for appearance and protection against corrosion. Anodized for appearance and protection against corrosion.